Life by the Creek: Our new collection! We have a new collection. We finished gathering up the rest of them yesterday. Looks like we'll be having a lot of pumpkin soup, pumpkin bread, pumpkin pie, pumpkin butter... etc, etc. Yay for pumpkins! I bought one to paint a face on, and I want more of them. 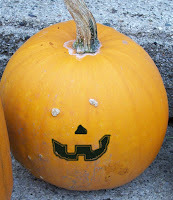 I just love pumpkins! 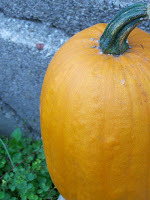 I bought canned pumpkin today to make pumpkin torte. It's just too good. Carol - thanks! :) I think it's pretty cute. They're actually lined up #3, #1, #4, #2. Ages 9-4. My plan is to take a new one every year.